Are you looking for home renovation work or some repair work in your home? It can be a plumber or electrician for a small repair, finding the right trades person for the right person is always important. But, how to find the right tradies in Australia for your such job? Do you go through the directories and online search spending more time? These are the most popular ways of finding any detail. However, that always consumes time. When you are busy with job and household works, time is really important. Update: We removed links from this site which directs to featured site in this post.As of 2018,it seems this website is not available. That’s why instead of using a directory or searching online for details, a mobile app is really useful. With the right mobile app, you can easily find the relevant details and get quotes for the work even while you are travelling or while you are in a queue for other task. With Hub of Services mobile app, you can easily find and hire the service providers in Australia without spending much time. As there are no middlemen, you will get the right quotation for the work with the best possible price. The app is completely free and you can download it from Google Play or App store. Once the app is downloaded, you can easily check for trades and select the professionals from the trade that you are looking for professional services. Isn’t this sound really convenient considering the time you need to spend to go through directories? Check www.hubofservices.com.au for more details on this mobile app. 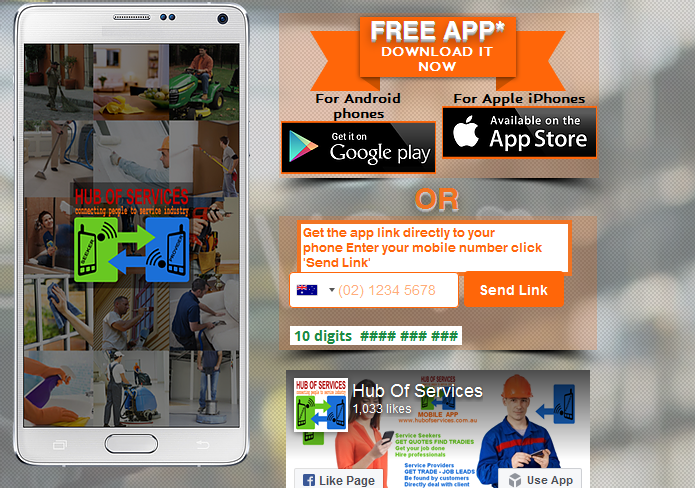 If you are a service provider in Australia, you can use the same app to share about your services and find new customers. Previous Article← How to Pick a Ride-on Toy for Your kid?